Stocks are lower after first quarter GDP was revised downward. Bonds and MBS are up. The second revision to first quarter GDP came in at -0.7%, a little better than expected. The port strike and a harsh winter are affecting the results somewhat, so take the number with a grain of salt. There are also questions regarding the seasonal adjustments BEA puts on GDP data – the first quarter has been unusually weak the past two years. Personal consumption came in at +1.8%, a small drop from the first revision and a touch lower than expected. The headline inflation number was negative, however the core was up 0.8%. Inflation is still running below the Fed’s target of 2%. In other economic data, the University of Michigan Consumer Sentiment survey improved in May to 90.7 from 88.6. The Chicago Purchasing Manager Index fell. Wall Street is a young person’s game for the most part – by the time you are in your 30s you are old and if you are in your 40s, you are a senior citizen. Right now, Wall Street is staffed with people who have never seen a rate hike. I keep saying it, but the stock market is assigning a 100% probability that the Fed can raise rates without anyone blowing up. The last 3 times rates rose, we blew up the MBS market, the stock market and the residential real estate market. And we have a sovereign debt bubble on our hands right now. Markets are flattish as Greek talks plod along in a directionless fashion. Bonds and MBS are flat. Mortgage Applications fell for the fifth week in a row, according to the MBA. Rates rose last week so that isn’t a surprise. Purchases were up 1.2% while refis fell 3.9%. Luxury homebuilder Toll Brothers reported this morning with EPS of 37 cents a share better than the Street estimate of 35 cents, however it looks like the beat was due to a lower-than-expected tax rate. Revenues were light as deliveries declined 1% in dollars and 2% in units. Net signed contracts rose 25% in dollars and average selling prices for net signed contracts increased 13% to $826,000. California demand is “very strong” as well as Texas and NYC. The rental business continues to grow. Overall, the high end of the market continues to perform very well. Was Elmer Fudd correct about adjustable rate mortgages? Seemed ill advised at the time, right ahead of a rate hike – seriously, with perfect clairvoyance he told people to take out ARMs before rates went up. Well, it required a bursting of the real estate bubble to make it work out. That said, if people move often, ARMs may in fact make sense. The Bernank doesn’t think China will have a hard landing. Given their real estate bubble, and the fact that their stock market has doubled over the past year, I find that wildly optimistic. It seems like countries that experience decades of fast growth tend to have hard landings (the US in the Great Depression, Japan now). Bull markets are a natural breeding ground for dumb debt-financed investments. Maybe the government wonks that run China’s economy can manage it through heavy-handed intervention in the markets, but it hasn’t been done before. The Feds are on the trail of massive corruption at FIFA. You mean to tell me there might be some jiggery-pokery going on in soccer? Venezuela has found a solution to its toilet paper shortage. Make the Bolivar note worth less than toilet paper. Stocks are down after Spanish elections over the weekend showed a move to the left. Euro bond yields are again going different directions, with the Greek, Spanish, and Portuguese bond yields increasing, and the Northern European yields falling. US Treasuries are getting pushed lower as well. We have a ton of economic data this morning. Durable Goods fell 0.5% in April, however when you strip out defense and transportation, they were up 0.8% and March’s -0.4% reading was revised upward to 1.0%. Capital Goods ex defense and transportation is considered to be a proxy for business capital expenditures, which has been more or less in maintenance mode since the financial crisis. We would need to see numbers around +1.5% – +2.0% to say that business is beginning to build out for expansion. New Home Sales rose to 517k from 484k in April. Given the strong housing starts numbers last week (highest since November 2007), we might be seeing a decent 2015 after all for the homebuilders and the real estate sector in general. Given the persistent shortage of available real estate (NAR has it at 5.4 months), I find it surprising it has taken this long. Home Prices continue to rise, according to Case-Shiller and the FHFA House Price Index. The FHFA index is up .3% in March and up 1.3% for the first quarter. This index is now within a couple percentage points of the January 2006 peak. The Case-Shiller index is up 0.95% for March and up 5% annually. The big gainers were San Francisco (up double digits again) and Denver. I suspect there is a lot of foreign money looking for a home in the big cities and that is affecting the Case-Shiller indices. The FHFA Index is narrower than Case-Shiller – it only looks at houses with a conforming mortgage, so it excludes a lot of the high end and the low end of the real estate market. Consumer confidence rose to 95.4 in May, up slightly from April, but still below the Jan peak of 103.8. The Richmond Fed Index rose slightly, and Markit is forecasting a slight downturn in the PMI indices. It is looking more and more like Greece is going to miss its payment to the IMF next week, unless they get more bailout funds. Here is a good FAQ of what can happen. I suspect the IMF and the ECB will come up with a way to kick the can down the road. Greek Banks are a hot mess (much of their capital consists of deferred tax assets and Greek sovereign debt) and they are completely dependent on emergency loan agreements from the ECB. If the government defaults on IMF payments, the ECB could declare the collateral backing these loans as ineligible (which makes sense since they are more or less defaulted securities), which would make the Greek banks insolvent and set the stage for a bank run. The big European banks all have at least some exposure to Greece and that will certainly be a consideration for the ECB. Public opinion supports keeping Greece in the EU so I suspect they will find a way. However if they do miss their payment and things take a turn for the worse, it is probably dollar (and bond) bullish. 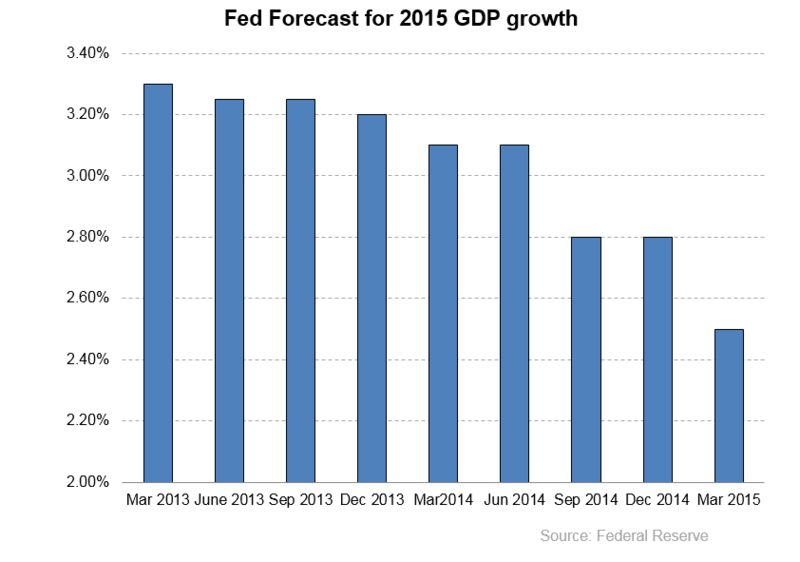 Interesting article about how the Fed has consistently overshot its economic forecasts for the US economy. The market however continues to disagree with the Fed, and it has been right. Take a look at the chart below. The Fed makes new economic forecasts quarterly, and I have tracked the Fed’s forecast for 2015 GDP since the March 2013 FOMC meeting. As you can see, two years ago, they thought 2015 GDP would come in around 3.3%. They are now forecasting 2%. Given that the Street is forecasting that the second revision to Q1 GDP is going to come in at -0.9% (we’ll get that number Friday), they will probably end up taking down their forecast at the June meeting. People are starting to think the next rate hike will be a 2016 event. Markets are lower after some hotter-than-expected inflation data. Bonds and MBS are down. Bonds will close early today, at 2:00 pm EST. Stocks are open a full day. The Consumer Price Index increased .1% in April, bang in line with expectations. Prices ex-food and energy rose .3% vs. the .2% forecast. On an annual basis, the CPI ex food and energy is up 1.8%. Real Average Weekly Earnings rose 2.3% on an annualized basis in April. Janet Yellen will be speaking at 1:00 pm EST. I can’t imagine she will say anything market moving an hour before the close on a 3-day weekend, but just be aware. Markets will become illiquid as the entire street will be on the L.I.E. by noon. Short missive today, as there really isn’t much to talk about. Have a good Memorial Day Weekend. Stocks are mixed as economic data continues to come in. Bonds and MBS are up small. Lots of economic data today. Existing Home Sales fell to 5.04 million in April from 5.21 in March, according to the NAR. Inventory is still low, however the situation is improving, with the unsold inventory increasing to 5.3 months’ worth from 4.6 months in March. The median home price rose to 219,400, which is up 8.9% year-over-year. 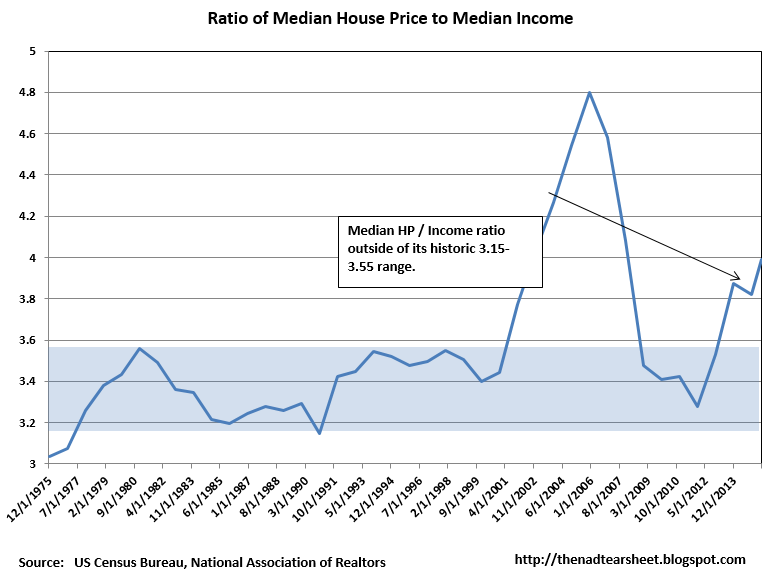 Real estate prices are getting frothy, as the median home price to median income ratio is now 4x, which is higher than its historical range of 3.2x – 3.6x. Low interest rates are playing a part here. That said, home price appreciation will be tough to come by going forward until we get some more wage growth. At some point, the builders will begin pumping out supply. Initial Jobless Claims came in at 274k, which is a very good number. The labor numbers continue to look okay, however it is a bifurcated market, where people with jobs are keeping them and the long term unemployed have given up. Consumer Comfort fell to 53.8 from 54.1, however the big number was the steep drop in economic expectations: from 50 to 44. The Chicago Fed National Activity Index improved in April from -.36 to -.15. The Markit US Manufacturing PMI fell to 53.8 from 54.1, the Philly Fed index fell to 6.7 from 7.5, and the Index of Leading Economic Indicators jumped from 0.4% to 0.7%. The ECB threw a nickel to Greece yesterday, giving them the smallest aid rise ever. Greece is warning that it will default in June, unless it gets more aid. Whatever money they have is going to go to public sector workers and pensioners. While both sides want Greece to stay in the Euro, their left wing government is complicating things. Which means the bond market will be susceptible to violent swings as we sort this out. The markets generally took the FOMC minutes to be dovish, and focused on the fact that only “a few” members of the Committee believed it would be appropriate to raise rates at the June meeting. They still believe that the first quarter weakness was “transitory” due to bad weather and the West Coast port strike. That said, the economy seems to not be exhibiting the same sort of rebound we saw last year, where we had a weak Q1 followed by a strong Q2 and Q3. We are definitely not seeing the same sort of rebound in economic activity this year. The Fed noted the additional volatility in the bond market (as has pretty much everyone in the mortgage business) and attributed it to the increasing presence of high frequency traders, lower dealer inventory, and the elevated holdings of bond funds. The minutes more or less confirmed the direction of market forecasts – a September hike is becoming more likely and a June hike less so.